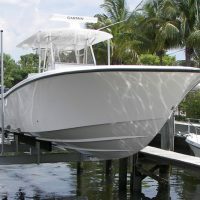 4- piling boat lifts, or as some say 4 Post Boat Lifts, have been the standard of choice for coastal boat owners for as long as anyone can remember and they are just as good of a choice for inland boat owners as well. Strong and reliable, simple and safe are the cornerstones of design for this lift. Although all 4 piling boatlifts have a similar design and have no part of the actual lift in the water when in the raised position, all 4-piling boat lifts are not created equal! We are proud to say our lifts are as good as any and better than most. No hollow promises here, just the truth! Lots of options and accessories for this type of lift. See individual product pages for more information. If you have any questions just give us a call! Whether your boat is 5,000 lbs or 50,000 lbs, we have a boat lift for you!